We have been having a nightmare for almost a month now. A collective nightmare? Well, sort of. Every night? Yes, with a break for a few days. What kind of nightmare? A very dark one, but also very kind and loving. Huh? Nightmare is not a bad dream (although she does have her turbulent moments), she is a dog. 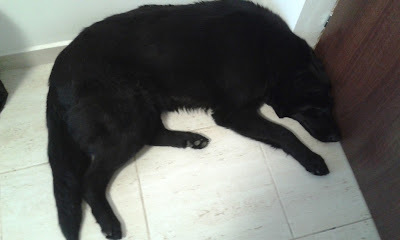 I always say she looks a lot like Aschiuta, but bigger, blacker and furrier. They have similar body shapes and they both have pointy ears. They are even alike in their behaviour, friendly and always willing to give you a hug and a kiss if you let them. I met Nightmare one night outside of the supermarket across the street, munching on a tray of sausages. I let her be, but when I went out of the shop, she came to sniff my shopping bags. I pet her a bit and tried to shake her off, but she followed me to our building. If you are familiar with the strays that occasionally get food from people, they develop a friendly but pushy personality, along with the beggar eyes (which Aschiuta also had when we first saw her). This trick often gets them food, especially if they know where to stay. They also get a lot of meat and bones, to the point where they become picky eaters and won't eat much else. Nightmare was one of them. I had no meat and knew she must have been full from the sausages she had eaten earlier, but thought I would try with a couple of jam cookies. Some dogs have a sweet tooth (Aschiuta sure does, but she only gets a few morsels), but the black stray would have none of my cookies. She just wanted to be pet. So I gave her some rubs and eventually went inside, leaving her in front of the door. That same night, my husband came home from his darts match and called me from downstairs. "Lavi, there is a very sweet black dog out here. She is so loving and I'm sure she is lost or abandoned. Please, can we take her in, at least until we find her a home? I don't want to leave her out here." I eventually gave in, thinking that there would be a lot of trouble. How would the new dog behave? How would she get along with Aschiuta? We also had another major problem... We had to leave for Brasov soon and stay for a few days for a darts tournament. We usually took Aschiuta with us, but what about the new dog?